Physical Description: 72 p., col. ill., 20 cm. 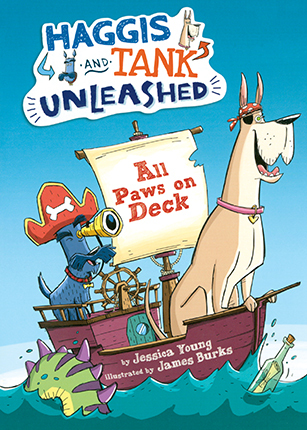 Booklist - 12/15/2015 Two canine pals star in this entertaining, comics-style chapter book series for early readers. Haggis, a Scottie dog, is bored, and lunchtime seems far away. But then Tank, a Great Dane, rolls by in her wagon and suggests playing pirates. Soon Bootleg Bonny (Tank) and Captain Scurvy (Haggis) are piloting their wagon turned ship, the Golden Biscuit, on an adventure. 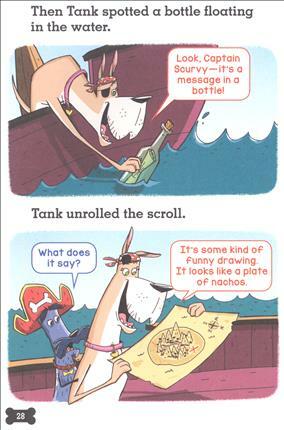 Excitement ensues when they find a possible treasure map, but their dig ashore proves fruitless, so “with heavy hearts and empty paws,” they sail homeward. Eventually, their imaginative escapades end, but when they arrive home, true—and delicious—treasure awaits. The spare, easy-to-read main text describes the events, and the stylized, full-color cartoon illustrations, complete with amusing speech-balloon conversations and asides, expand the story. Tank and Haggis have many homophone-related miscommunications, a concept, explained on the last page, which both helps aid reading comprehension and boosts the funny factor. Ultimately, playtime and wordplay match well here, but it’s the animated, distinctly drawn characters that will have kids seeking their future adventures. - Copyright 2015 Booklist. School Library Journal - 01/01/2016 K-Gr 3—Young introduces readers to Haggis, a bored Scottish terrier, and Tank, a Great Dane who is always up for a new escapade. With all the elements of a great pirate adventure, including a deserted island, sailor knots, and a buried treasure, Young gives authentic voice to her pup protagonist, creating an engaging narrative that young and newly emergent readers will look forward to. Burks's illustrations give life to these spirited characters, and his artwork reinforces the text throughout. The easy-to-read text, in conjunction with the color-coordinated dialogue bubbles for Haggis and Tank, makes the selection a must-have for the difficult-to-fill niche for readers transitioning from picture books and beginning readers to early chapter books. VERDICT A solid new series for newly independent chapter book readers.—John Trischitti, Midland County Public Libraries, TX - Copyright 2016 Publishers Weekly, Library Journal and/or School Library Journal used with permission.